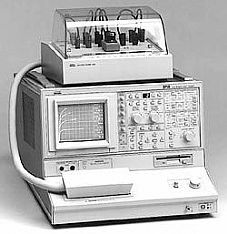 The Tektronix 371 High Power Programmable Curve Tracer provides DC parameter characterization of transistors, thyristors, diodes, SCRs, MOSFETs, optoelectronic components, solar cells, solid state displays, and other semiconductor devices. The 371 offers GPIB Programmable or front panel interactive operational control. Non-volatile memory is available for storage and recall of any previous characterization definitions. The 371 data is easily displayed on the bright digital storage display, as well as via the direct output to plotter (external controller not required).